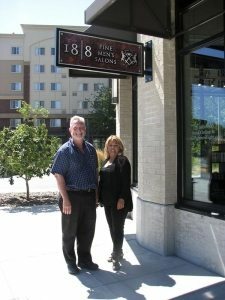 With a slogan that lists what men should never do as “one, you don’t go through your wife’s purse and two, you don’t go to her salon,” the 18|8 franchise has opened its first salon in Washington state under owner Steve Nordeen. Located in downtown Redmond at 16325 Cleveland St., 18|8 is a salon dedicated solely for male clients. The of franchise name 18|8 has its origins in the chemical formula of stainless steel: 18 parts chromium, eight parts nickel, which, when mixed with iron, form stainless steel. For more information, visit www.eighteeneight.com/redmond-wa.